Ladies, safety on first date is important irregardless of age. Lydia, principal life coach of LoveAgain.sg and CliqueWise.sg, shares some valuable tips to ensure that your first date experience is both safe and rewarding. She has been designing and facilitating singles events since 2006. Ask a lot of questions when communicating and look out for inconsistencies or requests for money. Take note if you are suspicious of anything. Use common sense. No need to feel obliged to meet that person just because he or she pressured you to do so. When both of you decide to meet face to face, pick a public location where other people are in close proximity. Avoid secluded places. Inform a close friend, colleague or family where you're going and who you are meeting. Let them know when you return from the date or you could arrange to meet up with friends after the date. When meeting for the first time, never allow your date to pick you up from your home. At the end of the date, your date might offer to send you home. You may suggest to him to walk you to the bus-stop or taxi stand instead. Carry your mobile with you so that you can contact your family or friends for help if need be. Please ensure the battery is charged. During a date, listen to your gut feel, if you are feeling uncomfortable with that person, leave immediately. If you need a second opinion, excuse yourself and call someone you can trust to discuss. Don't overdress or dress too revealingly as you may project the wrong image and invite unwanted trouble. You are going out on a date with someone you barely know. Take your time to get to know the person, one step at a time and at your own pace. Never let your guard down because you are having great chemistry together. Never assume a man is safe just because he claims to be religious or a gentleman. Alcohol or drugs affects your judgment and lessens your inhibitions. If possible, avoid alcohol on your first date. Drinking heavily and getting drunk on first date does not reflect well on you too. Getting to know your date can be fun and exciting. By creating a safe environment to know the person, you’re creating a better opportunity for yourself. After I've blogged about love scams, a lady —Ms M— shared with me a terrible experience she had with John, a local guy she met online recently. According to Ms M, she had spend about S$ 4000 during their dates and lend him S$ 1000 before he disappeared. Later, she found out from his online profile that a few ladies had been cheated by John too. They had made a police report and requested that I help to inform the rest of the singles about this man. Ms M had provided me his photos and screen capture of his profile. My comments are in red. 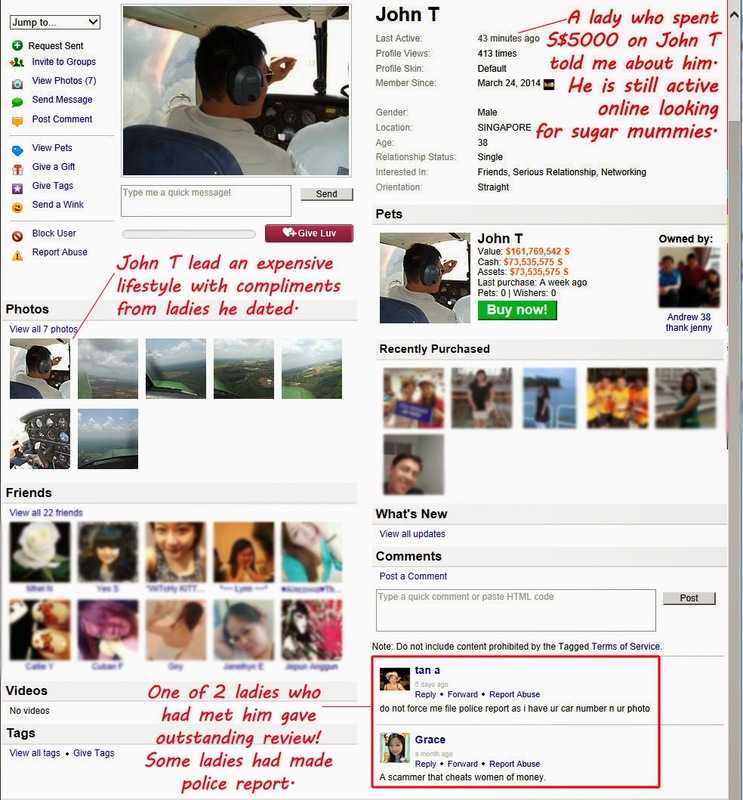 Above is the screen capture of his online profile which he used to meet ladies and get them to pay for his expensive toys and meals. After that he will borrow money from them and disappear. One of the ladies commented on his profile that he cheats women of money while the other threatened to make a police report. He might have changed his car plate and telephone by now. "I recently met a guy from Tagged who goes by the nick-> John T. He says his name is John Tan and his chinese name is called Shao Liang. His mobile no is 9793 4XXX. By the way he tells people that he works as a flight engineer. According to him, he said he is working with this company called Bombardier (which is located at Seletar Aerospace). He drives a weekend plate Mitsubishi Lancer which is red in color with no plate as 1068. He claims to have an elder brother who is already married and he is single and living with his mum. He mentioned that his dad is a retired chief SIA pilot trained in 747 and his mum is a retired teacher and he says he stays around East Coast. He says his birthday is on the 9th June. I met him on the night of 30th May 2014 (Friday) and we proceeded to a place near Haji Lane for drinks and talked the whole night through. He says that he knows how to play the piano and is also completed his grade 8. We chatted the whole night and we ordered only 2 Fiji Mineral Water and 1 Normal drink (Lime Freeze). Subsequently I went to the toilet and he settled the bill which I saw he paid using credit card. We went out again on the 1st June 2014 (Sunday) and I treated him to a dinner at Prive. He ordered so much food which was impossible to finish by 2 people. Subsequently I treated him to drink at 1-Altitude as well. He acted to gentleman and even drove all the way down to my office at Tanjong Pagar during lunch time to give me flowers and said the ERP and the S$20 for the red plate charge didn't bother him. Then on Tuesday, 3rd June 2014, he booked an expensive place-> Shinji Restaurant at Raffles Hotel and we went for dinner. He again ordered the most expensive set and I only ordered the cheaper set and he even ordered Sake. Once again, he said i owed him a treat cause I lost my bet and i was made to settle the bill again which was a whopping S$ 950!!! At the time, I asked him as a flight engineer how much does he earn exactly and he said about S$ 10000 a month and he even showed me his wallet had about S$ 3000 in cash. I told him his standard of living was way too high and this isn't the high of life I am used to. So he said its ok Thursday (5th June 2014), he will bring me to Equinox and buy me back a meal. Then he suddenly told me since his Birthday is coming on the 9th June 2014 and he wanted a remote control car. I told him sorry I am not able to afford what he wants but he insisted that we went to see since he already ordered the car. The shop is at Orchard Plaza called S'wan Trading. I refused to pay for him and told him since you ordered it yourself you pay for it yourself. But he beg and beg and he said why don't you pay for it first and I'll pay you pay in cash. Naively I believed him and I paid for it using my credit card which cost another S$ 2000. After that as we felt it was too early to proceed for dinner, we went to Marina Sqaure -> Yamaha Music School and he even showed me that he knows how to play the piano. He played 2 songs-> Canon in D Major and 听海 by 张惠妹. After that we left for Equinox. At Equniox, he ordered a lot yet again. Like he have never eaten in his whole life. We sat through and chatted and when it was time to settle the bill, he said "oh no, he can't find his wallet" probably left them in his car and he needs to go to his car to find. The restaurant manager was pressing for me to settle the bill and he didn't dare to come up and asked me to settle it for him first. I eventually did and the meal cost S$ 700+. In the car, he told me he didn't have cash and he needs to borrow S$ 1000 from me. I told him I didn't bring my ATM card then he was like begging and begging and I finally relented and went to withdraw S$1000 from him. Subsequently I haven't seen him from Friday till today (Sunday, 8th June 2014). I suspected he blocked me on Whatsapp but he didn't block me from calling him. I need to warn ladies about this guy. From what I know he borrowed S$3000 from another lady as well and disappeared." 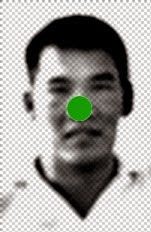 From the information Ms M provided, he looks physically fit, have dark skin tone, big nose, small eyes (single eye lids) and short black hair. He wears white polo tee-shirt usually. Ladies, please take note as he is still active online looking for sugar mummies. He even got intimate with some of the ladies whom he had taken money from. Imagine the anger, betrayal and disgust these ladies would have felt after they know his true colors! Friends and families, please forward this to all the single females to protect them from being hurt emotionally and financially!